Starting your Just Shutters Journey is easy! Contact the team today by calling 0757 602459. Alternatively, use the buttons above to book your home design visit or download our brochure. Shu tters are the most desirable window covering – it isn’t hard to see why. Firstly, shutters are simply stunning! Timeless style coupled with different finishing options (for example; louvres sizes, colours and materials) has seen interior designers fall in love with the product. 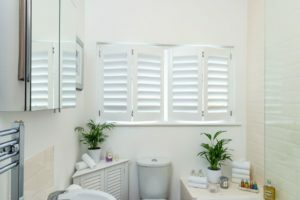 Our team knows all their is to know about shutters – they are all we do! As a result, with the help of the UK’s largest range of products, our experts will absolutely be able to find the perfect match for your home! Get inspired by viewing previous installations on our shutter galleries. -Child safety: There are no cords, and the slats will not trap little one’s fingers! Therefore, shutters are perfect for family homes. -Durability: shutters are built to last. Therefore, we offer a lifetime guarantee. -Ease of cleaning: Simply wipe your shutters to clean them! -Insulation: installing shutters adds an insulating later to your windows. As a result, heat is kept in your home and noise pollution is reduced.